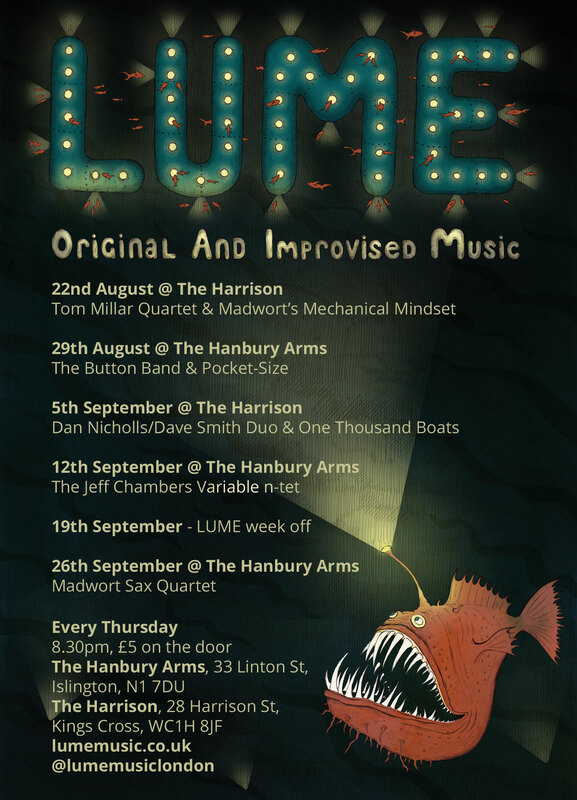 LUME opens it’s doors to THE HANBURY ARMS in Islington this Thursday 29th . A lovely upstairs room that will be our home every other week. It keeps things interesting – we like to think. This week an amazing double bill with The Button Band and Pocket-Size. The band showcases original music by Andy Button, written specifically for this line up. Lyrical jazz with folk and country influences drawing inspiration from Bill Frisell, Loose Tubes, Brad Shepic, PigFoot. This entry was posted in Uncategorized on August 26, 2013 by deebyrne. Anyway, this Thursday 22nd August at the Harrison it’s a double bill of bands led by Toms: pianist Tom Millar and sax player Tom Ward. 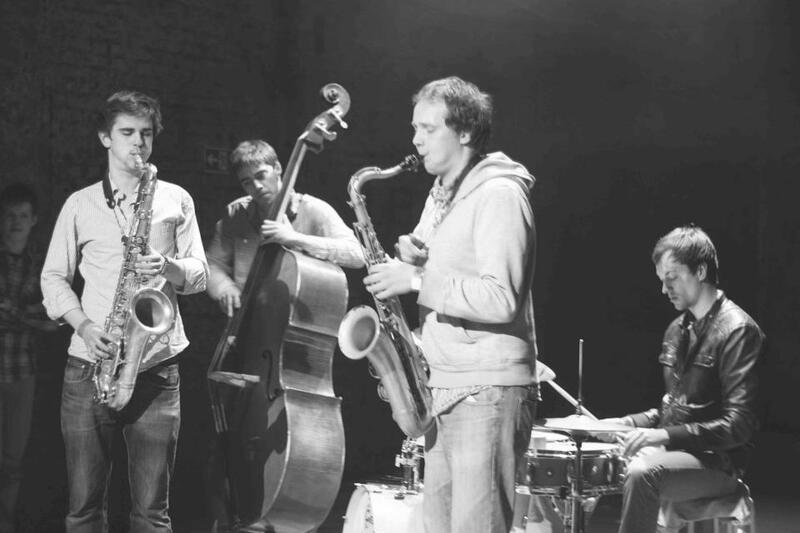 Tom Millar, chair of the Way Out West musicians’ collective and the man behind the current incarnation of the Green Note Jazz Jam (first Sunday of every month) formed his quartet in 2011. With guitarist Alex Roth, bassist James Opstad and drummer Mike Clowes, the group play mostly Tom’s compositions and have been gigging regularly around London. Yeah! Come with us to The Harrison for an evening of new music! 28 Harrison Street, Kings Cross, WC1H 8JF. Doors 8pm, £5 entry. This entry was posted in News on August 19, 2013 by cath. Led by trumpeter/composer Henry Spencer, the band performs original compositions that take on influences from a range of genres such as jazz, rock and minimalism. The compositions are written by Henry Spencer. Carnival rain is a collaboration between SE Collective members Alam Nathoo (Sax) & Matt Ridley (Bass), along with trumpeter/composer Joe Morris and F-ire Collective stalwart and Oriole bandleader/guitarist Jonny Phillips. Drawing on Tango, Flamenco and Jazz as influences, the band combine the subtlety of a chamber ensemble with the vibrance of latin street performers. Doors 8pm, music 8.30pm, £5 entry upstairs an Hundred Crows Rising, 58 Penton St, N1 9PZ…5 mins’ from Angel tube! This entry was posted in Uncategorized on August 10, 2013 by deebyrne. This week we welcome to LUME Dee Byrne‘s band Entropi! Dee put the group together while studying at Trinity College of Music in 2010 and they explore her growing repertoire of original music. Expect heavy grooves juxtaposed with outbreaks of swing, tight arrangements framing open-ended improvisation, abstract harmony mixed with melodic departures. This will be an intergalactic evening of space sonics! With special guests Nick Walters and Olie Brice. More recordings, videos and info can be found on the Entropi website. This entry was posted in News on August 7, 2013 by cath.